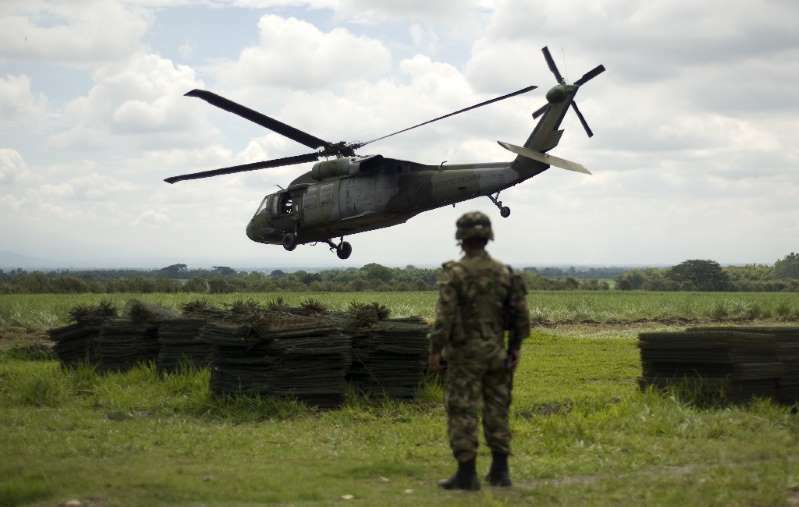 A Colombian military helicopter crashed on Saturday after conducting an operation against drug traffickers, killing all four crew members, officials announced. Defense Minister Guillermo Botero, in a Twitter message, identified the dead as Major Pedro Granados, Captain David Quintero, Sergeant Ramiro Santos and Corporal Eduardo Gutierrez. The wreckage of the helicopter, an army Black Hawk, was found on the ground between the cities of Balboa and Argelia in the country's west. Bad weather hampered the search. A team of specialized technical investigators was heading to the crash site, a military statement said. The craft was returning to the Jose Hilario Lopez base in the city of Popayan -- capital of Cauca department, where the government has been battling both rebels and drug gangs -- when it disappeared from radars. The army said it immediately sent troops of an anti-drug brigade to the crash site, but bad weather impeded their efforts. The government has long struggled against illegal armed groups and drug gangs in Cauca, whose strategic position on the Pacific Coast has made it a launching point for cocaine shipments to Central America and the United States. Colombia remains the world's leading producer of cocaine, and the US remains the largest consumer.